Seen above: Deputy K9 Officer Mike Carlson and Luke, a 2 ½ year old English black lab and the most recent addition to the Chester County K9 unit, show off their skills to CertainTeed employees as part of K9 Veteran’s Day. The K9 unit from the Chester County Sheriff’s department made a special visit to CertainTeed’s Malvern Headquarters in honor of K9 Veteran’s Day. The dogs were brought onsite at the invitation of the Veterans’ Employee Resource Group to help raise awareness of the working dogs that serve our country – and receive a much deserved pat on the back. The dogs start their training between 13-18 months and from there become fully integrated parts of their handler’s day. Whether preparing a meal or watching a movie these dedicated service dogs are never more than a few steps away. 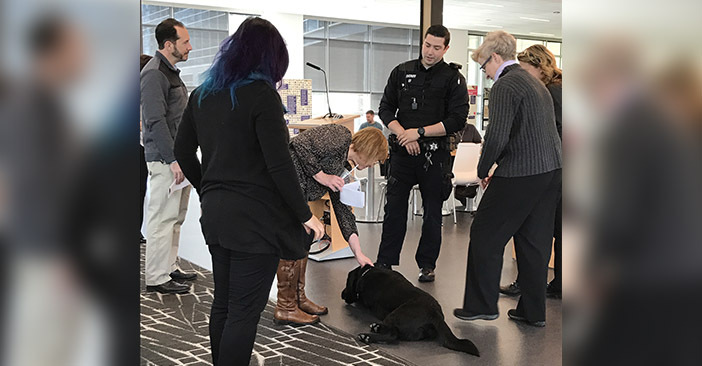 “They are 100% a part of your life,” Deputy K9 Officer Mike Sarro told the group of employee that had gathered to a watch drug retrieval demonstration. The onsite opportunity has benefits for employees as well. Studies show having dogs in the workplace can help lower stress among employees. The Chester County K-9 unit is supported entirely by private funding. Visit the Chester County website for more information on supporting this amazing cause.